We're in the middle of a heatwave in the UK so that may have affected my choices for this months favourite four from sponsors Eternal Maker and Plush Addict! Eternal Maker: Garment making fabrics for hot days. Robert Kaufman Stitched Ocean Aqua Pin Dot. Drapey fabric with a woven pin dot in a glorious blue. 44"/110cm Wide. Also available in white with woven red dot. 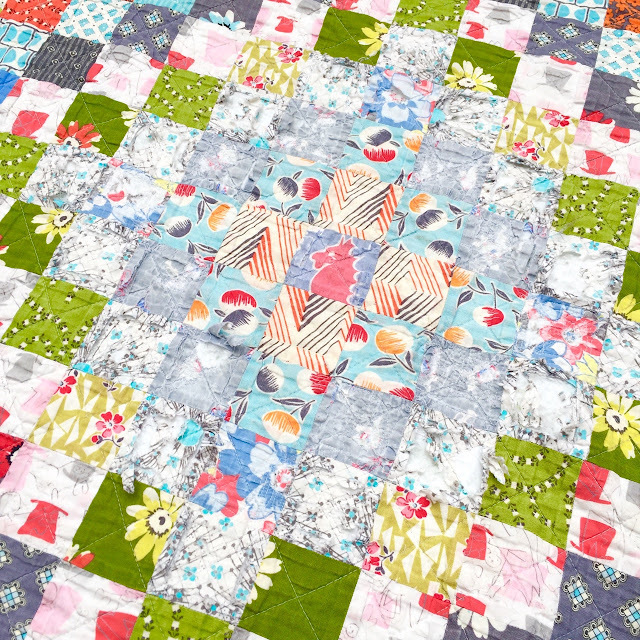 Dashwood Sweet Notes Cotton Candy Lawn. 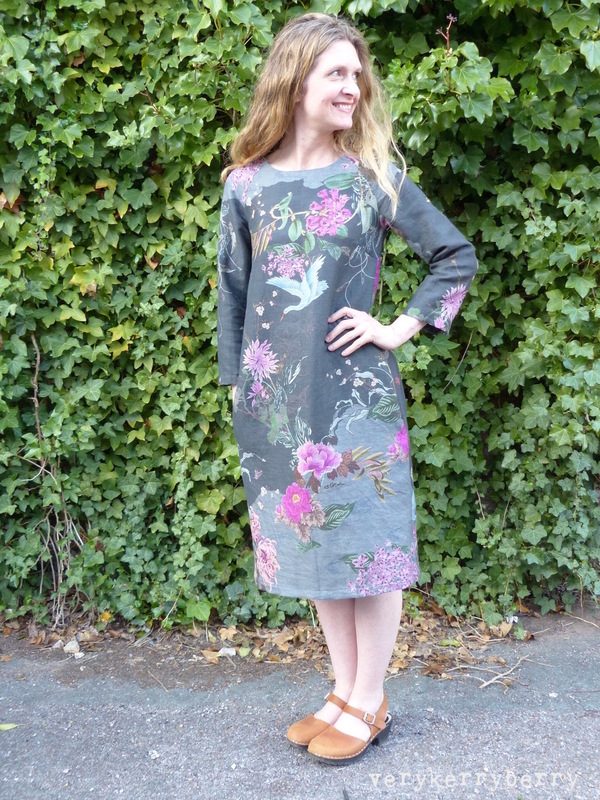 The prettiest modern floral print on floaty cotton lawn. 56"/140cm wide. Seersucker Cotton Floral. Gentle ripple texture from the seersucker and dasiy style motif. 110cm wide. Kokka Rayon Double gauze. Wonderful for creating cool, breathable clothing. 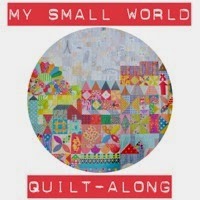 Plush Addict: A quilting FQ bundle selection featuring the newest arrivals and a golden oldie. 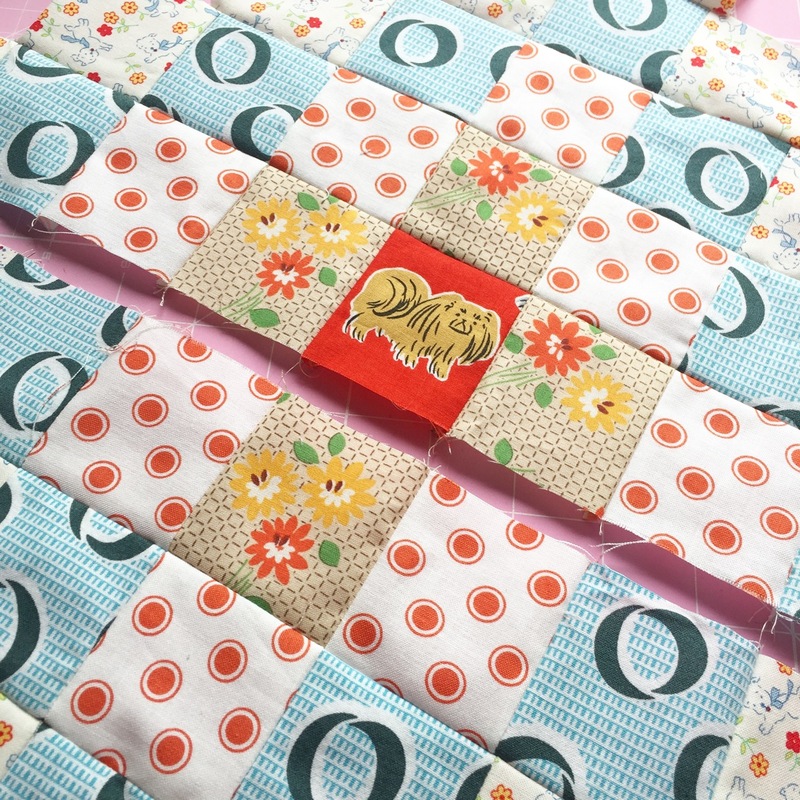 Nutex Woodland Friends 5FQ Bundle. 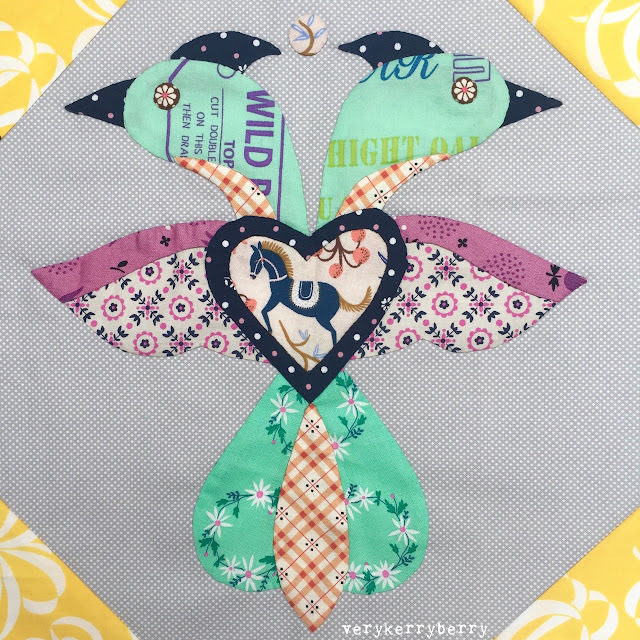 Zesty colours and cute designs! Riley Blake Cats Bats and Jacks. I don't go for many seasonal fabrics but this Halloween collection has some very appealing prints, I particularly love the cats. A Little Sweetness Tasha Noel 9FQ Bundle for Riley Blake. 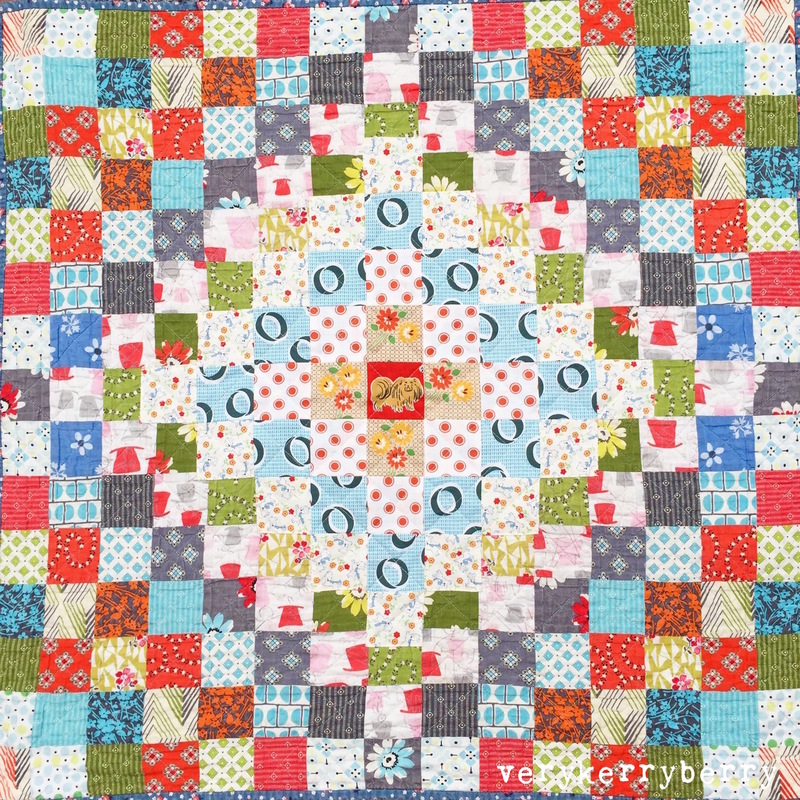 An older but a goodie with cute vintage motifs, ideal for hexies and fussy cutting, plus a classic red/aqua/navy clour palette. 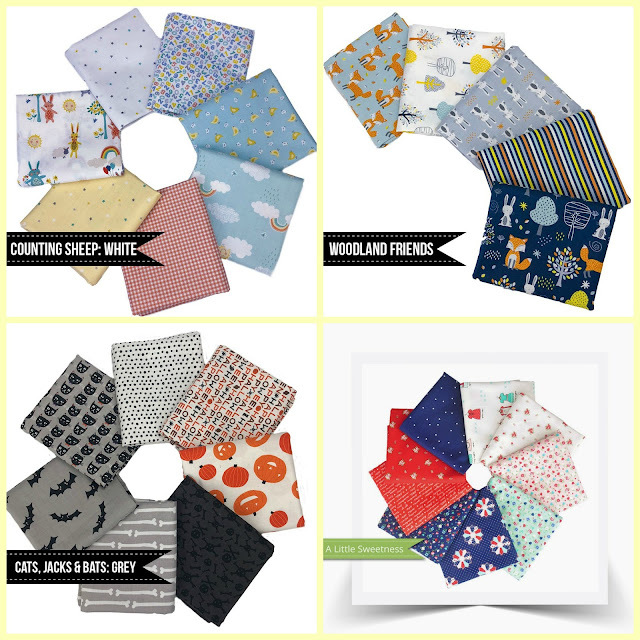 The fabric in each bundle is generally available as yardage so if you wish to pick and mix prints and ranges, or buy few FQs, you can do. 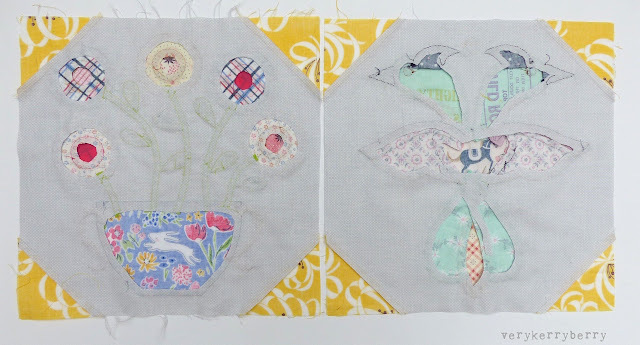 I made a lap quilt for Lottie six years ago and it is much loved. It is very much hers and she associates it with sitting on my knee. If we need to travel or go somewhere with her, it calms and settles her. 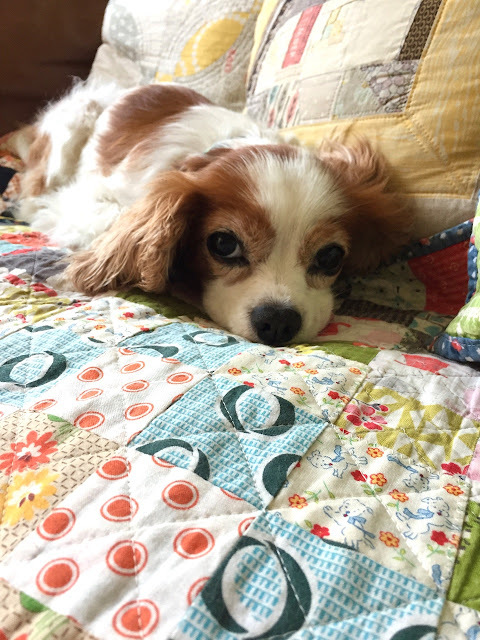 She has another quilt and more blankets, but this one is special. 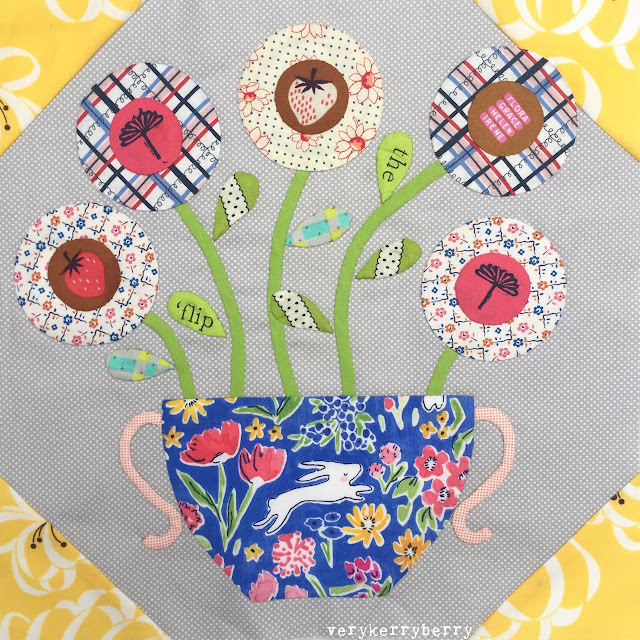 When I originally made it, I combined vintage fabric with Denyse Schmidt and some of the vintage squares in the centre started wearing out a couple of years ago. I had darned them on the machine but more washing and use meant more drastic action was needed. So, I pulled together some similar fabrics- DS and other repro styles and made a centre Around-the-World block to applique on top. Around-the-world mid-construction. 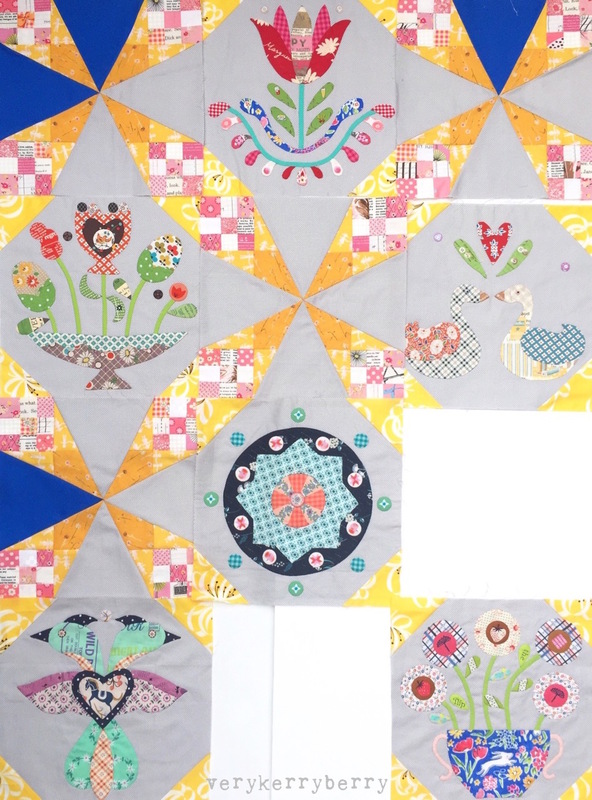 The centre dog is from a Michael Miller/Tammis Keefe Tribute Dogs fabric from a friend. 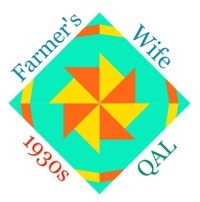 These squares were cut the same size as those in the original quilt, but it has been washed and used so many times that the old squares had shrunk and the new additions extended over them when I zip zagged the block edges on top. I quilted through the new squares to match the previous quilting. Here she is, just about to snooze. She's been fortunate to respond to the various heart medications well so we feel we've had extra time. She's still a happy, silly loving pup, living life to the full. June and July are crazily busy months for me, a mix of work, deadlines, family events which is taking up all my time. 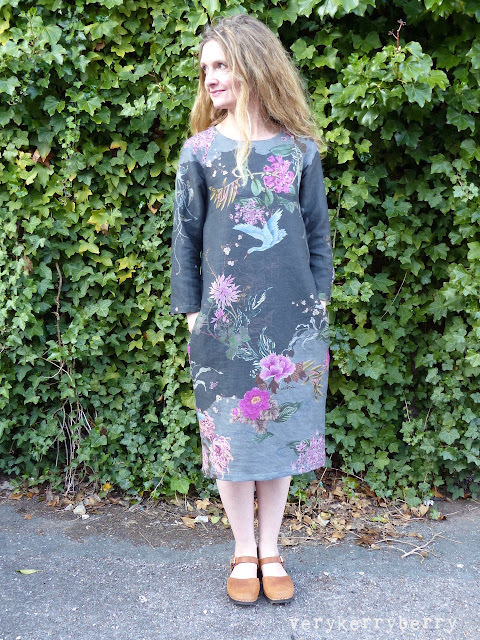 I made this dress at least 6 weeks ago and usually in a British summer, it would've had lots of wear, but this year we jumped from a late spring into a warm summer which shows no signs of stopping and long sleeves are too hot, but I loved the pattern, I've just cut out two more summery versions so I thought I'd share this one before I stitch up the others! I haven't experienced an Avid Seamstress pattern before. 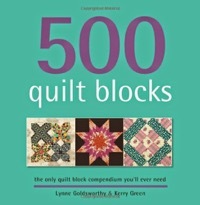 As with the majority of indie printed patterns, it is beautifully produced with a colour booklet and step-by-step instructions. 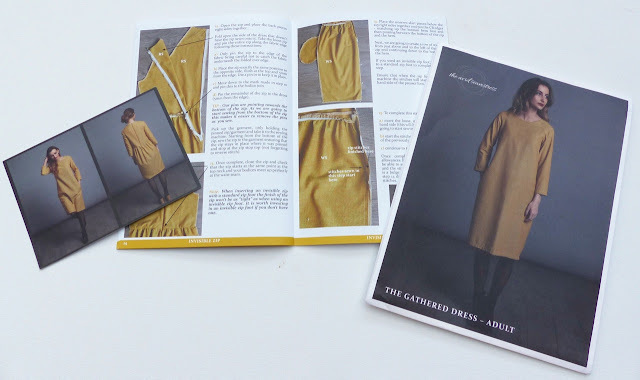 The Gathered Dress is based on their already successful child's Gathered Dress pattern. The adult version has a raglan sleeve and side seam pockets. The main feature is the gathered back waist detail. It's a simple, well-cut dress shape, with minimal details and a relatively quick sew. There's a zip closure but after sewing a quick test version, I could see I didn't need it so I cut the back as one piece and omitted the zip. 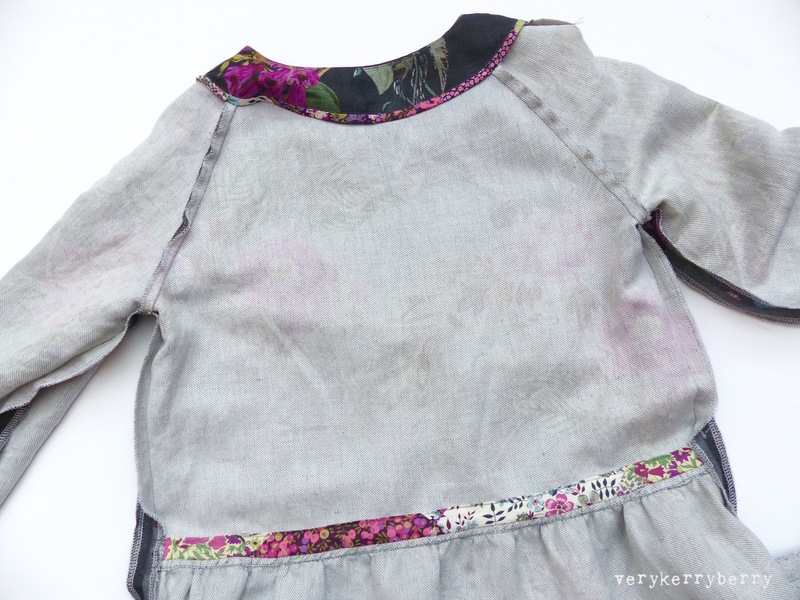 No interfacing is needed (hooray!) and the uninterrupted front section is perfect for a feature fabric. It's a variation on a shift dress and the back detail is what swung it for me, a basic shift often doesn't do much for my shape; this dress had the extra element whilst retaining a gentle fit. I had two metres of a wide Italian linen twill weave bought from Stitch Fabrics at a local fabric fair. I made a size 1 (UK size 8) and the fit was almost perfect for me. The only thing I changed was to lengthen the bust darts by 3/8" to the 0/UK 6 size lines which is quite a common bust alteration for me. I also flared the bottom of the hem by around 1/2" on each side to add a little extra flare to the side seams I walk quickly with quite a generous stride and so I wanted just a little extra room. I particularly like the fit of the neck and shoulders and I can see this pattern becoming the basis of other tops and dresses. I am very small busted so anyone larger than a B cup may need to make a full bust adjustment. I followed the instructions all the way through which start suggesting that after sewing the bust darts, most seam edges are finished before sewing. I never usually do this but on a simple style like this it really sped up the sewing process and as the fabric frayed very easily it was extra helpful. They suggest using an elastic method to gather the back skirt but I didn't find this worked for me; I used my usual three rows of long machine stitches instead. The instructions are generally good with one or two little niggles where the pictures don't quite match the process- e.g. the sleeve shoulder dart came together following the instructions but it didn't quite match the picture, and occasionally some extra pressing details would've been good but these are minor elements in what was a really enjoyable make. I added some homemade Liberty Lawn binding to the neck facing and over the back waist seam; it just makes the edges a little softer against the skin. 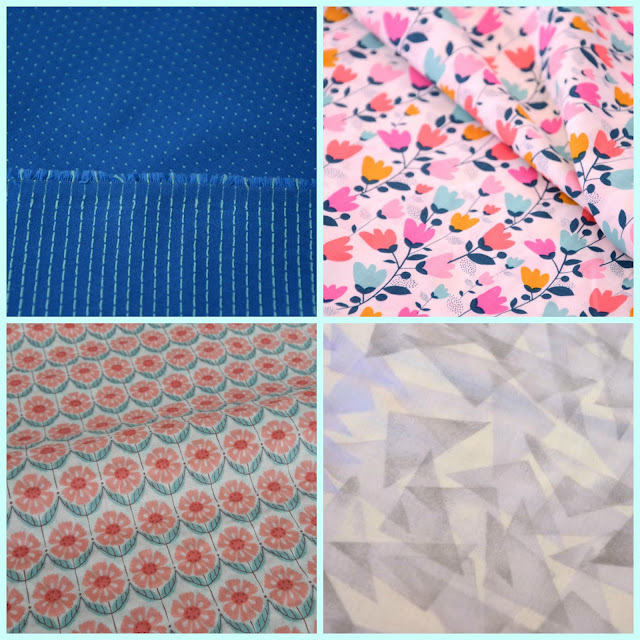 I've just cut out a short sleeved version in Nani Iro doubgauze whichich I'm currently sewing up and traced off a short font and back bodice to add to a gathered maxi skirt so it looks like it will be a versatile pattern for me. 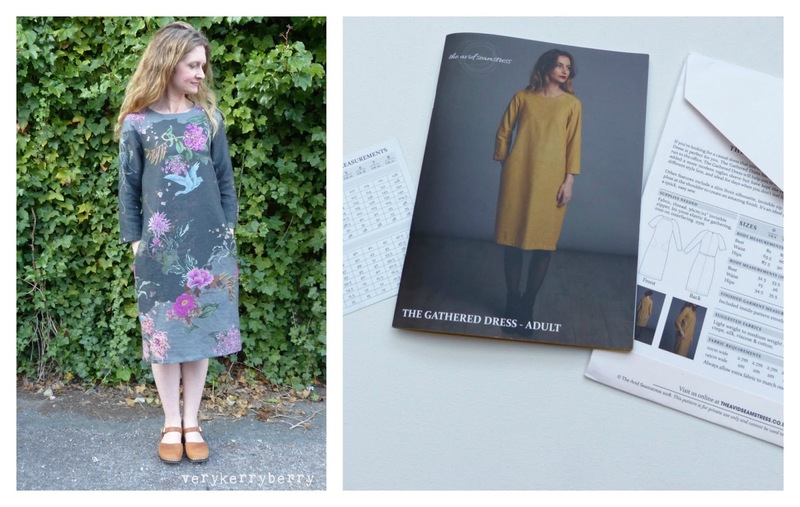 You can find the Gathered Dress at Village Haberdashery and Backstitch or buy direct from Avid Seamstress as a printed or PDF pattern. There seems to be a blogger glitch with comments at the moment- they don't come through to my email so I'll reply below instead! The second block, 'birds' (with a hint of marine creature) were hard going, maybe the hardest so far. Symmetrical blocks are always tricky and I found I was glueing and repositioning many, many times as I kept finding parts which weren't covering other sections sufficiently. The tail was made in three pieces which worked well for fabric pattern placement but it would've been easier as one piece with the centre piece on top. The neck accents were very fiddly, the top is narrow and there's a lot of seam allowance to cram into the point. I'm tenacious when I'm faced with challenges so I'll keep working at it until I get the finish that I'm hoping for. It's all a learning experience and I am learning a lot. Here's the reverse and now that there's been more guidance, I'm feeling more confident cutting away the back fabric. This is how all the blocks are looking so far spread out on white boards. I still have a lot of the spacer blocks to make. Time is short this month, there's a lot on with work and family and I have other demands that are taking up all my spare sewing moments. I'll carve out a day somewhere, I like keeping up, it drives me onwards!